Since late August, four Washington State University football players have been arrested by the Pullman Police Department. But until today, none of them had been charged with any crime. That has changed. The Whitman County Prosecutor's Office has charged Logan Tago with fourth-degree assault and second-degree robbery, a felony. Tago was arrested last month for allegedly being part of a group of people who mugged another man for a pack of beer in June. The group reportedly demanded that a man give them the beer, and when the victim refused, police say they assaulted him and stole it, leaving the victim with a concussion. The victim identified Tago as one of the assailants. 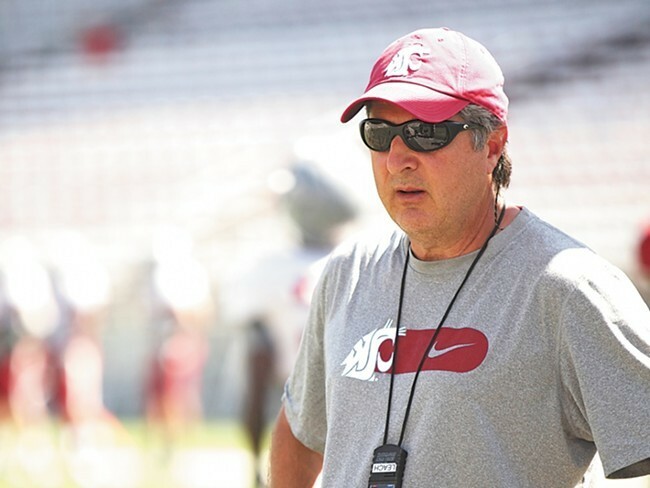 Shortly after Tago was arrested last month, WSU head coach Mike Leach issued a statement that, in his view, the police target his football players. Referencing Tago's case, he specifically questioned why the arrest occurred four months after the incident, and why other people involved in these fights aren't being arrested as well. His comments set off a local and national controversy. According to the prosecutor's office, police only recommended charges for Tago in connection with the June incident. Shalom Luani, one of the three other players arrested, was involved in a fight outside a Domino's Pizza joint, though prosecutors have said they will not file charges against Luani. Two other players, Robert Barber and TJ Fehoko, were arrested for felony assault after their involvement in a summer frat-party brawl. They have yet to be charged. Tago played in the WSU win over Stanford this past weekend, as did Barber, who was recently expelled by the school for the summer brawl (he appealed the decision). Luani missed one game following his arrest but has played every game since. In the event the student-athlete is charged with a felony, absent extraordinary circumstances determined by the director of athletics and sport supervisor, he/she will not be permitted to represent WSU athletics in outside competition until such time as the case is resolved and all court, university and athletics department conditions for reinstatement have been met. But Leach may go against that policy, going by his comments to the Seattle Times: "If I have anything to do with it, he'll play till he's proven guilty. We're going to presume people innocent until proven guilty around here." Whitman County Prosecutor Denis Tracy said Friday that he has still not received any referral concerning the July brawl involving Barber and Fehoko that left one student with a concussion and another with a broken jaw in July. Pullman police said on Sept. 16 that they would forward the case against Barber and Fehoko to prosecutors "next week." When asked by the Inlander three days ago when they anticipate charges to be filed, Police Chief Gay Jenkins, through an assistant, again said they expect to report to the prosecutor "sometime next week." WSU athletic department spokesman Bill Stevens has not responded to an Inlander request for comment on whether Tago will be disciplined in accordance with the athletic department policy.